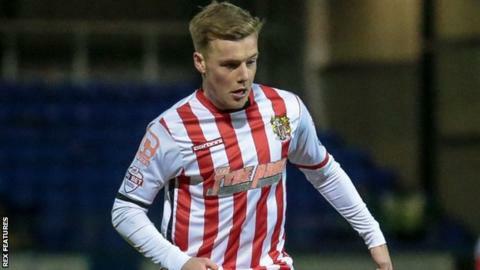 Two goals from Tom Conlon helped Stevenage end a nine-match winless run by beating Hartlepool in League Two. Conlon gave the visitors the lead when he powered a left-foot shot into the top corner from the edge of the box. Aaron O'Connor set up Conlon to tap in his second, before Billy Paynter's volley reduced the deficit for Pools. Paynter had a shot cleared off the line as the hosts pushed for an equaliser, but Boro held on for their first win under caretaker manager Darren Sarll. Stevenage move 11 points clear of the relegation places, while the home side remain second from bottom, four points adrift of safety. Match ends, Hartlepool United 1, Stevenage 2. Second Half ends, Hartlepool United 1, Stevenage 2. Attempt missed. Tom Conlon (Stevenage) left footed shot from outside the box is high and wide to the right. Substitution, Stevenage. Dale Gorman replaces Tom Pett. Foul by Keith Keane (Stevenage). Substitution, Stevenage. Lee Cox replaces Ryan Hedges. Substitution, Hartlepool United. Josh Laurent replaces Jake Gray. Substitution, Hartlepool United. Rakish Bingham replaces Nathan Thomas. Attempt missed. Luke James (Hartlepool United) header from the left side of the box is just a bit too high. Attempt blocked. Billy Paynter (Hartlepool United) right footed shot from the centre of the box is blocked. Nathan Thomas (Hartlepool United) is shown the yellow card for a bad foul. Attempt saved. Jordan Richards (Hartlepool United) right footed shot from outside the box is saved in the bottom left corner. Delay in match Tom Pett (Stevenage) because of an injury. Attempt missed. Nathan Thomas (Hartlepool United) left footed shot from outside the box is high and wide to the left. Goal! Hartlepool United 1, Stevenage 2. Billy Paynter (Hartlepool United) right footed shot from the centre of the box to the top right corner. Assisted by Jordan Richards. Delay in match Luke James (Hartlepool United) because of an injury. Substitution, Hartlepool United. Scott Fenwick replaces Lewis Hawkins. Attempt saved. Ryan Hedges (Stevenage) left footed shot from outside the box is saved in the top centre of the goal. Corner, Hartlepool United. Conceded by Keith Keane. Corner, Hartlepool United. Conceded by Tom Conlon. Goal! Hartlepool United 0, Stevenage 2. Tom Conlon (Stevenage) left footed shot from the centre of the box to the centre of the goal.